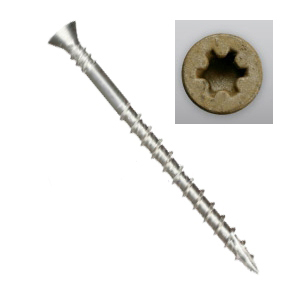 APPLICATIONS: Premium 304 stainless steel screws suitable for all types of environments. For high-acetic woods such as redwood and cedar. Small head reduces countersink torque. 2/3 thread ensures tight connection. Type 17 point reduces splitting. Also useful for attaching Concrete roof tile to wood. Type 17 point improves penetration of tile. Meets Miami-Dade County, FL Protocol PA 114-95, Appendix E, Section 2 (ASTM G85). #10 available in 316 SS with #3 star drive.